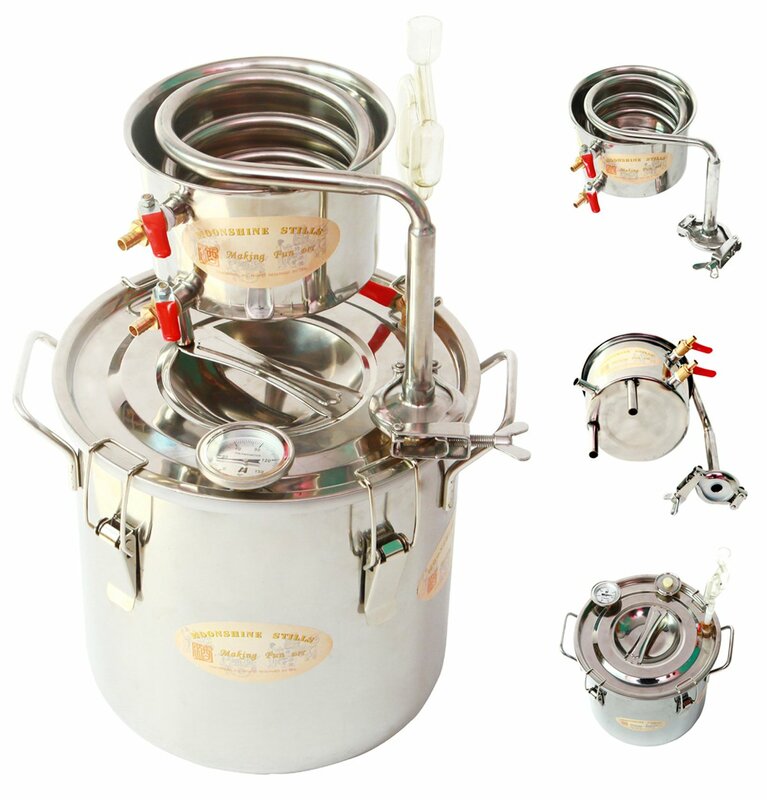 Distillation is beautiful process and it can be used to create a variety of things. Water distillation is an important tool for survival and we are lucky to have a lot of affordable distillers out there that make it easy to distill water at home. You can also distill a lot of other things like essential oils. A lot of water sources that are deemed “safe” may contain pollutants and chemicals that you don’t want to be consuming in large quantities. Well water and community water sources are often not tested for contamination unless a major problem is suspected. Other concerns are how water is treated. Chlorine and fluoride are two things that are commonly added to municipal water supplies. Many people neglect to acknowledge that chemical fertilizer and agricultural run off can be a major source of polluted water. Deeper wells are less likely to be contaminated. There is also the issue of broken pipes and cracked well heads and casings can allow bacteria and chemical pollution into a water supply that people would normally deem safe. Distillation can make salt water into something you can actually drink and survive! Distillation can make salt water drinkable and you can get sea salt as a byproduct. The downside is the resulting water tastes objectionable to most. At the same time in a survival situation, you can take some bad taste to get through. If you have something to help cover up the taste like lemon juice or some type of powdered drink mix then it might be a little easier to stomach. Distillation of water saves money and is easier than one might think. For a long time, there was some stigma about owning a still. The stories I have told here about my family being moonshiners in the past highlight that. The fines, jail time, and trouble scared people into thinking that if they owned a still then they were risking some very serious trouble. The truth is that having a still is not illegal in itself. What is illegal is when you make liquor without applying and being approved for the proper permits and of course this is the big one that the government really cares about, not paying taxes on alcohol that you produce. Distilling water does not have the potential for accidents that distilling other things does. Water unlike alcohol is not going to catch on fire. This solar still is one of the more expensive models on our list but it produces up to 18 gallons of distilled water per day. It also has an auto fill feature so you don’t have to constantly be filling it up. This would be a good solution for large groups or community water situations. 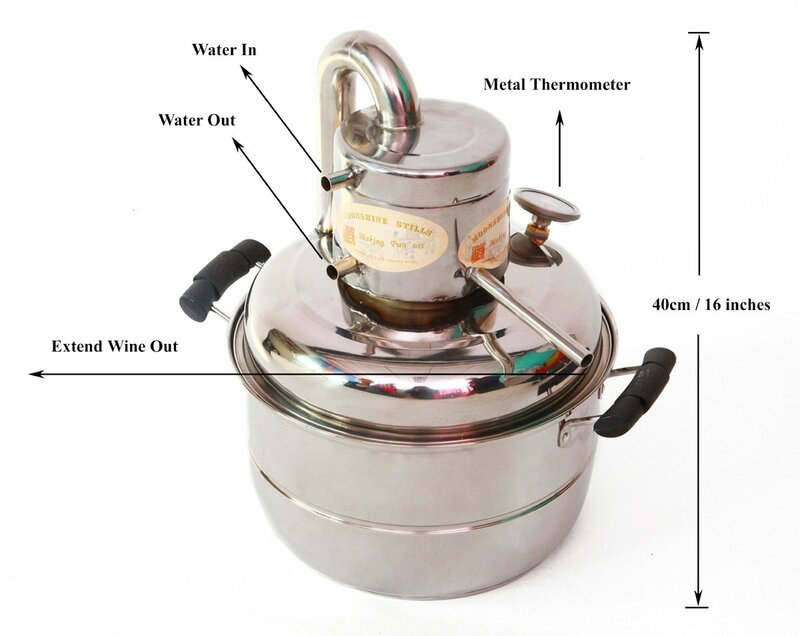 This pot still is made of all stainless steel and can be used on your stove top or an outside burner. I like that this design has a decent capacity for the price and who can argue with getting a still delivered via Amazon Prime in two days. The 3 gallon size offers a good capacity for emergencies but is large enough to not be frustrating for a family to use for distilled water needs. This 8 gallon still is a behemoth but will still fit onto a standard stove so long as there is adequate clearance between your stove and the range hood. 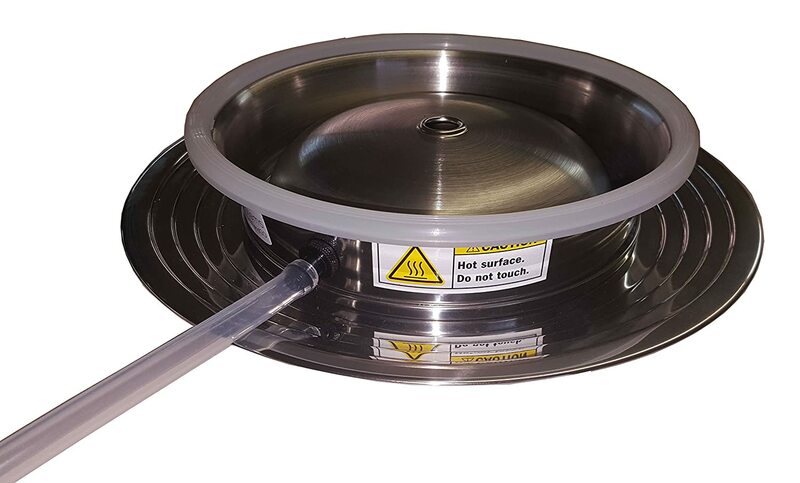 If your range hood is a bit low then you can always use this unit on a propane powered burner or a grill set over a fire if really necessary. You can get enough distilled water for a very large group. In fact with this unit you could have distilled water to sell or trade if you wanted to which could be a nice thing when you consider how ill prepared some are to meet even basic water needs during a major situation. 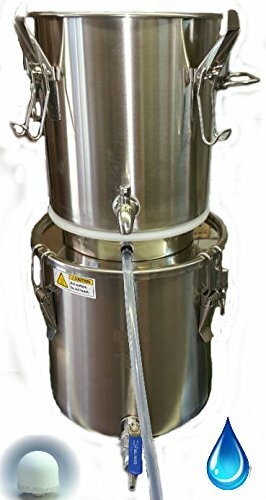 This distiller is our most compact model on the list and really only made to produce distilled water in a real emergency or survival situation so if you are looking for a more “multi purpose” unit to meet other needs then this is not the one for you. 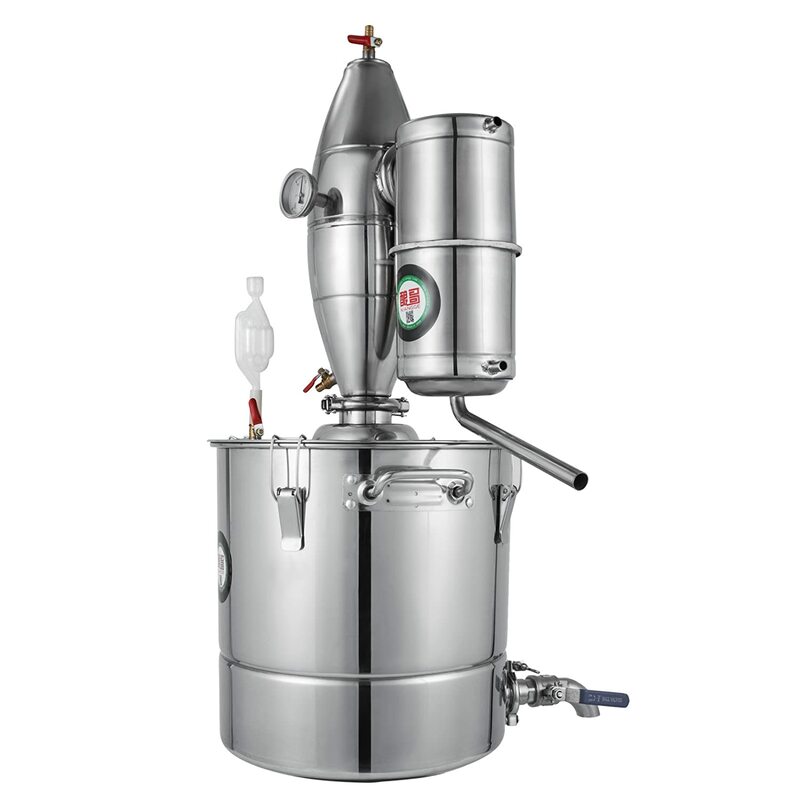 You can use your own pots with this distiller so you don’t have to buy more unless you just want a designated still pot. 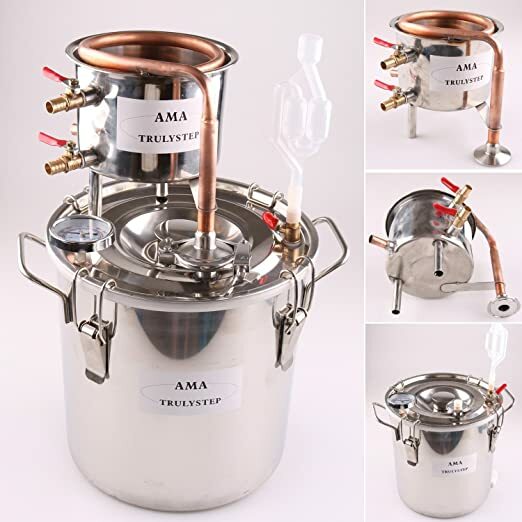 However if you are short on space and want a quality compact water distillation unit that can be used on a very small heat source then this is one that is worth looking at. The government takes taxation of alcohol very seriously even though we live in a day and age when you can buy a still and get it in two days with Amazon Prime. It is not worth the trouble and honestly it is a lot of work and by the time you add up the time and materials you have put into “moonshine” it is not worth it. My Papaw was known to say that “Making liquor is not for a lazy man” and he was right. Ingredients cost more now and there are not as many “dry” counties so the incentive versus the risk means why bother. Although a lot of people probably don’t want to talk about it, there was a lot of rot gut liquor made back in the day. If you want white liquor then go buy some at the store. I honestly wouldn’t trust just anyone’s product either. Making liquor is an art and it takes practice and dedication. When we have a working and legal winery we plan on getting a permit and making legal “grappa” out of grape skins and leftovers from winemaking like they do in Italy. I really hope we can do that one day. In short it is in your best interested to not mess with untaxed alcohol. Now in a SHTF situation go for it because it will be a valuable trade item for obvious reasons plus you can can distill alcohol out to be strong enough to disinfect and make tinctures. I will admit that when I think of distillation my thoughts always go to liquor as you might have noticed. I pretty much owe a lot of what I have to moonshine. One thing my Mamaw told me years ago was that “If he had not made a little liquor, it would have been rough. I’m not sure what we would have done.” The he was my grandfather Leonard. My great grandfather Fred used to carry liquor from Little Canada, NC to the Sunburst logging camp and sell it to my Grandpa Leonard to resell to the loggers and men around the camp. When my parent’s met years later in Sedro-Woolley, Washington they found out they had this connection from many years ago. Liquor helped supplement a logging income and that money helped my grandfather through the tough times and to get a little place up the Pigeon River that eventually the paper mill wanted to buy. They offered him a good price and a lifetime job at the mill which was about as good as you could do back then. This allowed him to eventually be able to buy some land and then eventually buy some more. A portion of this land is what gave me my start so I am very thankful for the hard working distillers and mill workers in my family. I hope to be able to do it the legal way once our winery is in operation and we have all our papers and permits and bonds in order! Like I explained, it is not worth the risk and not really profitable anyway to do it without a legitimate business. I never got to meet my grandfather Leonard because I was the youngest of my generation and grew up out in Washington State instead of North Carolina. He passed when I was 3 years old and I didn’t move back to North Carolina until I was 16 when I got on a Greyhound bus with two bags and my father and never told the rest of my family we were even leaving. It had to be that way and it was one of the better decisions of my life. Distilled water is great for wet cell batteries, but not for humans on a steady basis. You need the mineral content of natural water for your health. 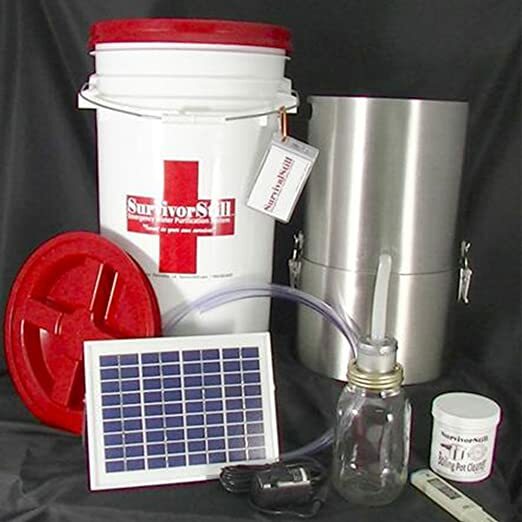 Another good emergency water distiller that can be used over any heat source, including a campfire, is the Survival Still. I’m personally a distilled water drinker but I also do blood labs every 3 months checking my calcium, potassium and my alkalinity and acidic ph… My sugars are high but I like honey in my coffee and tequila in my grapefruit juice!